Those of you who have followed US musician Lucky Brown‘s tireless efforts in crafting quality music since joining the Tramp family in 2007 can no doubt hear the progress he and his various ensembles have made in almost every musical aspect throughout the years. His songwriting skills have won fans the world over from the very get-go, but what deserves even more respect is his proven ability to be one of the most authentic and steady but also innovative creative minds on the contemporary funk scene. Many of today’s funk bands are able to deliver a two-and-a-half minute funk killer, but what distinguishes Lucky Brown is his ability to create compositions that also employ the idiom as a means to deliver an artistic message, an indescribable feeling, or a conscious concept, just like James Brown and Fela Kuti did in the 1970s. Furthermore, Lucky has developed his own unique production and sound whose depth and honesty form the basis for his timeless work. But that’s nothing new as can be heard on his first two albums for Tramp: “Lucky Brown’s Space Dream” from 2011 and “Mystery Road” from 2015. 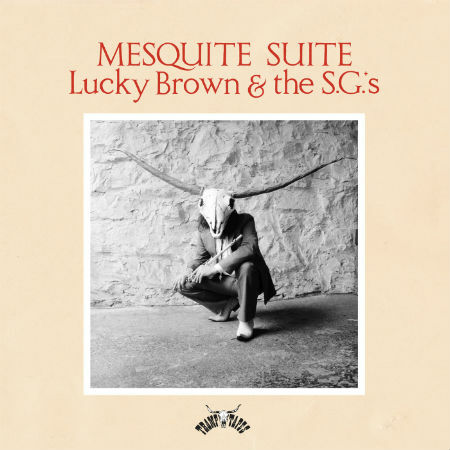 On his new and third full-length, “Mesquite Suite” he is forging new paths by soaking up musical styles from all over the world to infuse with his own trademark deep funk sound. Perfect examples are the Mulatu Astatke-ish tracks “Bless Your Soul” and “Mother Corn Stalk” with their distinctive New Orleans Swamp-Jazz flavor. While fans of the Menahan Street Band or El Michels Affair may gravitate towards “Pauraque” and “Taterbug”. But it’s the entirety which makes this album a standout. And in keeping with Lucky Brown‘s low-fi, analog music-making methods, the full-length will be limited to 500 hand-numbered copies of beautiful double-vinyl with a deluxe gatefold cover, including the full album download code. It has been Lucky Brown‘s aim to paint for the world a picture of the vernacular jazz that America’s neighborhoods once crafted as their own homegrown cultural heritage. Lucky Brown‘s music is a rejection of the elitism, classism, and status of the music industrial complex and is an antitoxin to its resultant homogeneity. He wants with his heart and his art to transmit an everyday people’s sound, made by everyday people, dedicated to the uplifting of all people.